Gov. 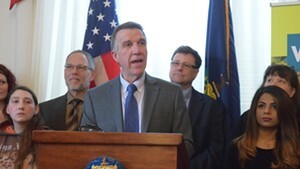 Phil Scott and the legislative money committee chairs listen to economists Tom Kavet and Jeff Carr on Thursday. 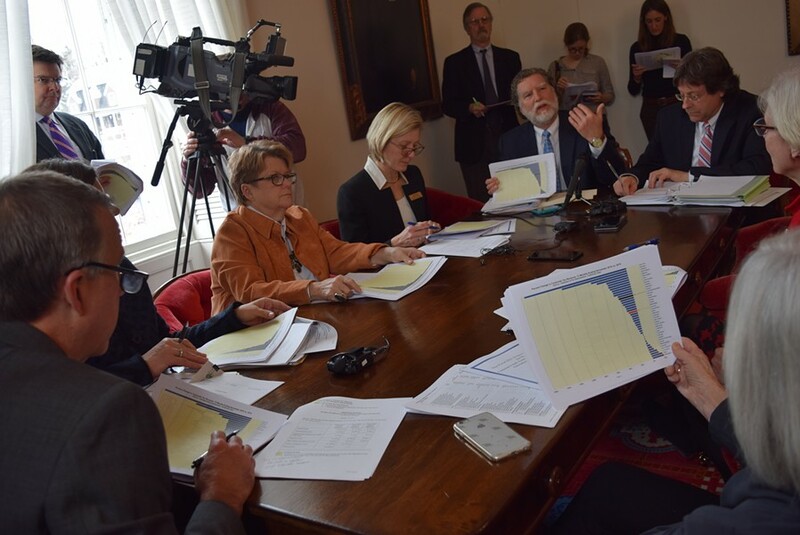 Economists told the state’s Emergency Board on Thursday that Vermont is likely to see less money coming in over the next two years than previously thought. For fiscal year 2017, which lasts through June, the state can expect to see $24.6 million less in general fund revenues than had been anticipated. For the 2018 budget, Gov. 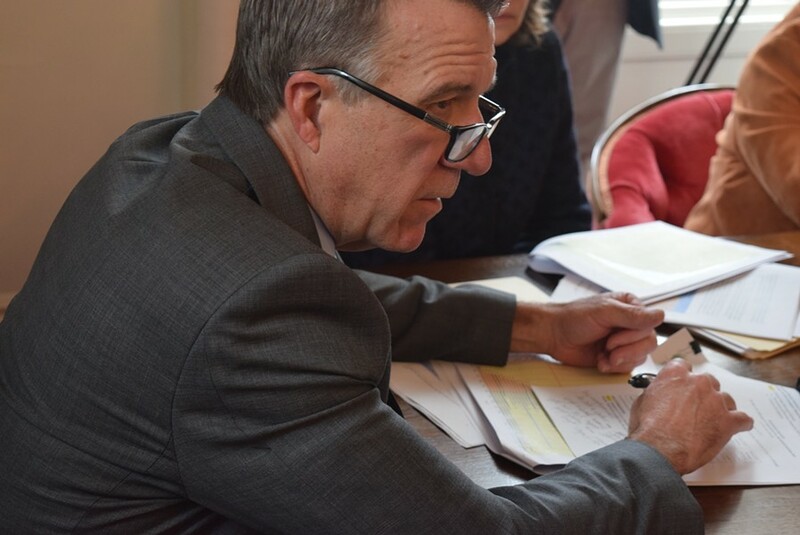 Phil Scott and legislative leaders were told to expect $7.7 million less than previously thought. And in 2019, expectations were curtailed by $10.4 million. To handle the blow in the current 2017 budget, Scott’s financial team doesn’t seem to be sweating the details. Finance Commissioner Andy Pallito said he is proposing to tap into various reserve funds and areas where spending was less than expected. The biggest factor driving that is a decline in the corporate income tax. That was the word from two economists who represent the legislature and the administration as they presented their recommendations to the Emergency Board. The board includes the governor and the chairs of the House and Senate money committees. Tom Kavet, the legislature’s economist, argued that a drop in corporate income tax isn’t necessarily a sign of doom. It could be that businesses have been hiring, are paying more in salaries but have not yet starting yielding increased profits. Three times in history, he said, corporate income dropped without leading to a recession. “We think this will be the fourth,” he said. By March, the current period of economic growth will be the third longest in history. The number of open employment positions in Vermont has finally climbed out of the pit it fell into in 2009. Current openings now roughly match 2000 levels. And layoffs in Vermont last year were reported to be at a 16-year low. Wages are inching up in Vermont. In December, they were reported up 2.9 percent over the previous year. The state faces demographic challenges. Vermont has the lowest fertility rate in the country. And Vermont was one of only three states that lost population from 2010 to 2016, with a drop of 0.2 percent. Only West Virginia and Illinois were in similar plights. Despite a low unemployment rate, the state’s overall job count is softening. From September to November last year, Vermont lost 3,200 jobs, the largest decline since 2009. Pending December numbers, the state could have a net loss of jobs for the calendar year.